Playing dominos in the carny quarters on the San Mateo County Fairgrounds in California, these carnies are “cutting up jackpots,” swapping stories and laughing. 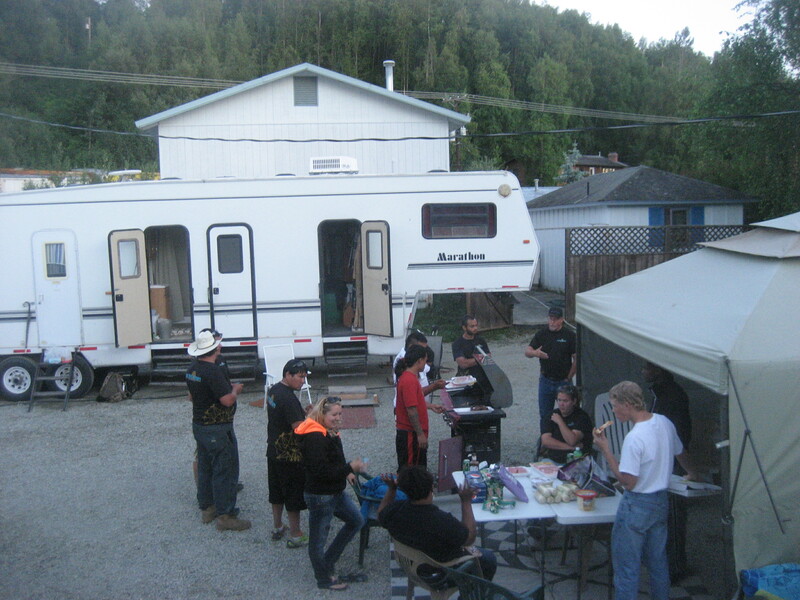 Workers gather at the end of the day for food and a bit of socializing in Chugiak, Alaska. In the ten states I worked carnivals this last year, I lived on the border of Chugach National Forest in Alaska and in a cow pasture outside Chicago with 40 Black Angus cows and a big, dirty bull. It’s called The 30 because US Route 30, the legendary Lincoln Highway, runs along the border of the cow pasture. The Lincoln Highway was the first bi-coastal highway in the country. It was one of many fabled highways I traveled this year in carnivals from Route 66 to the Alaska Highway. As bad as my conditions were, others had it worse. 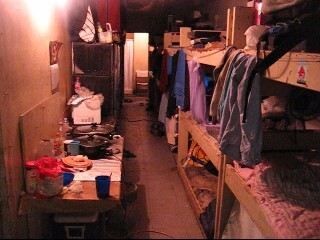 One couple lived in the underbelly of a trailer, that looked something like an animal transport trailer. That carnival troop had no H2-B visa workers, migrants working from Mexico, South Africa, Jamaica or other countries. Last month I met James Judkins, the biggest migration agent for Mexicans in the country. I asked him why he didn’t send people to that carnival company, he said because the living conditions were too raw for the Mexicans. During my final tear down in Chicago, Peanut told me that I was going to miss my family, the carnival. I’ll even miss the cows, he said. He was right to link the carnival family with the cows. In New Jersey, an electrical short caused sparks and smoke. It drove us out of the bunkhouses. When the smoke cleared, we went back to bed. The owners the next day said it was our fault for leaving on the water heater. No apologies for the fire hazard. Workers didn’t want to take frequent cold showers. The Laundromat van sometimes skipped a week. I never saw a reefer with circulating air. So those trailers smelled of working men. In Chicago I saw 40 cows in the carny quarters, in Alaska I witnessed a moose and her cub walk majestically through camp. I remember stressing out about the viability of my year in carnivals when the rap music turned down and I heard a young woman singing softly to a ballad. The noisy night became quiet. No other word for it than pretty. The rocking went on most of the night but I was happy to hear the man once in a while say, “quiet Mike will hear you.” Every little bit of courtesy is appreciated here. The closeness led to bickering and to closeness. When carnival people talk about the carnival family, it’s because they work all day together and sleep side-by-side at night. Yet I also saw bunkhouses and ‘barrios’ filled with all the human foibles, passions, vices and fun of traveling small towns. They were as good as their people, living close and close to the bone. I spent the last year working and living in carnivals in California, New Jersey, New York, Chicago, Alaska, Minnesota, Oklahoma, Texas, Georgia and Florida. Because I lived on carnival wages, I hitchhiked between jumps for about 15,000 miles, making me America’s #1 hitchhiker for 2013-14. 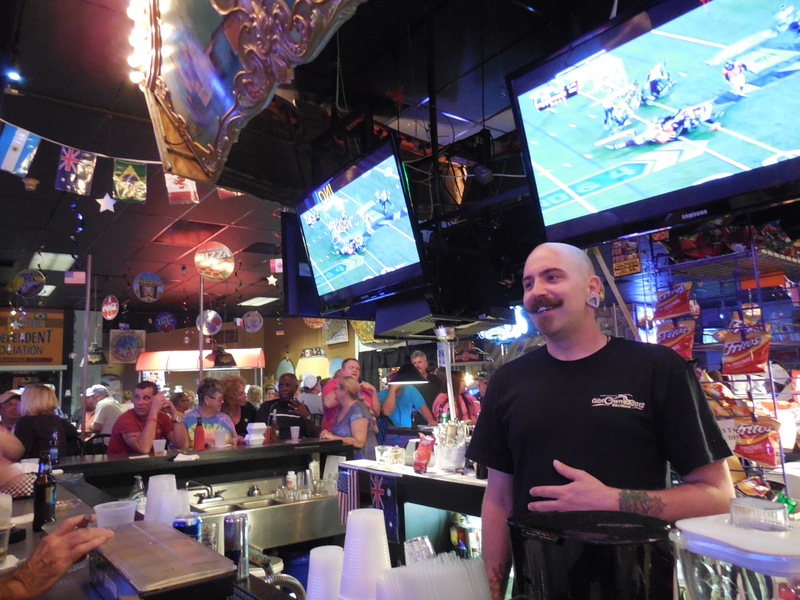 The 30-ish bartender sports a shiny bald head, purple triangle earrings and a Buffalo Bill Cody goatee. I decide to take a seat where the bartender gets ice, so he can pause to talk once in a while. I’m on the hunt for carnival stories. My duck blind is the main bar in Showtown USA, during its annual traveling carnival trade show in February. Not many people were there yet. It’s a long rectangular bar with flat screen TVs. Brightly lit, real Italian- painted carousel scenery panels above the bar made it carnival chic. I remembered an encounter the night before, when I walked in with a carny who knew I was looking for stories. We chuckled and looked around the room, not at the each other. The bartender’s name is Kelly Wilson and he was born into the carnival business. His parents were in the business, he grew up in games and food wagons. His eyes are clear and he sports an easy, full smile. Buffalo Bill Cody was the greatest showman of the early 20ths Century and the first to join a the first showmen’s association. Kelly Wilson’s look shows he knows his showmen’s traditions. That, plus he knows it looks cool in a place like this. I just knew the story safe at a carnival trade show would be at the bar and the key is the bartender with the Buffalo Bill beard. Kelly learns from everything he comes across, religion, philosophy, music and art. He’d be a humanities scholar if he ever went to college. “My college is life,” he said as he poured rum and coke. Then he began mixing disciplines. He was careful not to “dis” Christianity either. He’s not ruling out ideas so much as seeking unifying laws for life. “Kindness,” Gandhi and food service are the disparate concepts he’s been mulling. The “season” calls him back, though, like it does migrating birds. Maybe it’s because he was raised on the road in a cramped blue trailer, in a family of six. His childhood was spent running around, free rides, free sweets, playing with the other carnival kids from town to town. He worked some games coming up but he spent more than half his life on the road making cotton candy, gyros, pizzas and hamburgers. When he reached his teen years the cramped living and maybe his phase in life, led to lots of arguing. Sometimes it was great but somewhere it turned. Music was his savior. At his first “Rave” he had an epiphany. I don’t have to live like this any more. Nevermind he was already traveling wide, it was a freedom song to him. From July to October he travels the Midwest and South working a Mexican food trailer. About five years ago he began selling hula hoops on the side. On breaks he went to the meeting room off the bar area so he could hula with kids. Kelly hears all the wild carnival stories as he pours drinks but I asked him what’s the weirdest thing he ever saw on the road. He kept pouring drinks and making change but was stumped for a while. When I prod him about his future, he says maybe he’ll buy his own trailer some day. Which tells me, he isn’t like some carnival people I’ve known who envied homes in towns they passed. He was more like a nester, who sets up home where he migrates. Once again, he searches for the unifying theory of his life. What I find disorienting about his unified theory is the backdrop. We’re in a carnival bar, everyone in this bar is a carnival person. He was raised in carnivals and lives in carnivals. Yet he’s not jaded. His theories are idealistic, at times romanticized and wishful. Bob Marley, the Allman Brothers, Daoism, Buddhism, Christianity, Gandhi, cooking, traveling and “kindness” even to the mean people. Such are the truths he lives by – Wilson’s laws – as he dances in hula hoops through life with his beard of Buffalo Bill. I recently finished working a year in traveling carnivals in California, New Jersey, New York, Chicago, Alaska, Minnesota, Oklahoma, Texas, Georgia and a Florida freak show. I trekked down into Mexico to see the new face of American carnivals, Mexican carnies. I’ve traveled more than 20,000 miles through 36 states, Canada and Mexico. I’m attempting to sell a book on the America I saw from the carny quarters and the side of the highway. Video of my Mexican co-workers from San Mateo and Martinez, California to Tlapocoyan, Veracruz, Mexico. I used Son Jarocho music, La Bamba, sung by Los Lobos. Emerging from the shower in the reefer, I was alone in the sleeping quarters for more than a dozen Mexican migrant carnival workers. Unexpectedly, opportunity was at hand. I went to the Mexican reefer for the shower but when I finished it was empty. My camera was in my pack beside the cramped shower. Time to film. I rushed, putting my clothes and fast-walking to the front of the bunkhouse trailer. I took tiny steps, in order to avoid slipping on the water I was still dripping. Wood bunks with thin mattresses were stacked three high on the left wall. Lockers and a table for hotplates and spices lined the opposite wall. Work clothes hung from bunks to air out. Carnival workers work extraordinary hours, 60 to 80 hour weeks aren’t unusual. Hundred hour weeks are unusual but happen. You didn’t want to miss the bus to the local beat-up, coin-laundromat. The bus was always unscheduled and sometimes skipped a week. 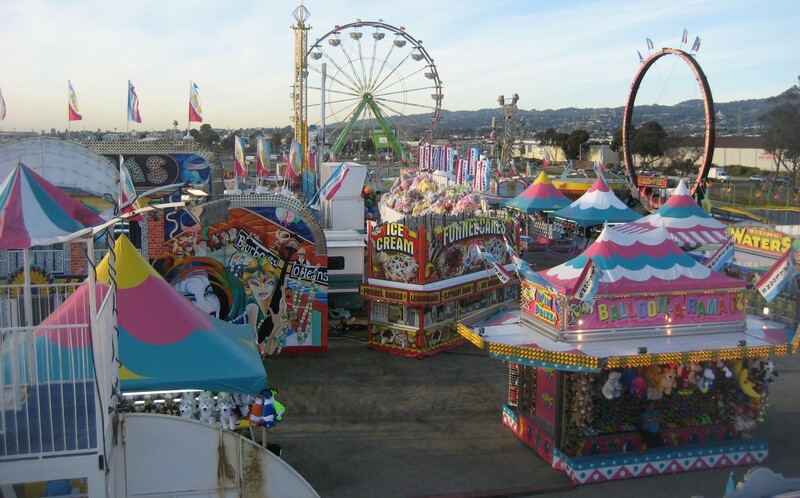 Our reefers in my San Francisco Bay area carnival smelled like work. I went to film from the opposite side of the trailer, by the refrigerator and sink. It was also near the exit, should I need a quick getaway. The suspense was crazy high. People in carnivals are always walking around corners. It’s like a Shakespearian play that way, someone is always opening a door, overhearing a scandalous comment or bumping into someone. Everyone knows what you’ve been eating. They’ve seen what you’ve been drinking. Everyone is guessing about who might be sleeping with whom. I imagine people lying awake listening through the thin bunkhouse trailer walls. Nothing is private and not even your dream life, because people speculate about that too. The lack of privacy is magnified in reefers because people are piled on top of each other. They didn’t need to listen through walls to hear someone sleep talking. Their meals were communal, everyone pitching in a few Yankee dollars for supplies. The donnikers, (carny lingo for port-a-potties)were just a few feet from the front door of the reefer. My bargain-basement camera blurred at the least bit of movement. Picture after picture blurred in my shaky hand. I cursed and kept taking unusable pictures. I decided to take a video, I could always take a snapshot off the video. If someone walked in while I was panning across the reefer with my camera, there would be hell to pay. Bosses would be told. I’d be unmasked as a spy. In the days of carnival lore, disloyal carnies were beaten or thrown from the train. Workers have been beaten for drinking on the job. Some have been beaten for mouthing off to the owner. Some carnivals, allegedly one I worked on later, beat people up for leaving before the end of the season. I had no idea what I might face if caught. I wasn’t just in danger of being fired or beaten. My year in carnivals could be defeated by gossip. Not only do people know everything about you in the carny quarters but carnies talk across carnivals. A reluctant spy, I was forced by circumstance into working as a carny but writing every spare moment about their lives. My spy career began with the a colorful carnival owner and ex-pro wrestler, with the stage-name of Bo Paradise. He owned the first carnival I worked for, Classic Amusement in Hayward, California. However, he fired me after he judged my blogging to be dangerous for business. Then he told me he thought the carnival project was a stupid idea. No owner will allow a writer in his carnival. Even if I’m hired, I don’t speak Spanish and the new face of the American carnival is Mexican. I won’t have access to the dominant work sector. Yet there I was showering in the reefer, which was the exclusively Mexican bunkhouse. They’re called ‘reefers’ because they supposedly have ‘refrigeration’ during the summer. Unlike the bunkhouse I lived in, Mexicans lived rent-free. I paid $50 a week for a six-foot, by five-foot bunk room. They lived shoulder-to-shoulder and slept in stacked bunks. I befriended my Mexican coworkers and they were comfortable enough to allow me into the reefer unsupervised. Showering in the reefers was another way to open communications. Being seen with a camera in their quarters would sound alarm bells for management because we already knew Butler Amusements was being sued by Mexican employees. My Mexican pals thought they knew who was suing but their names were deleted from the lawsuit for fear of retribution. If coworkers knew their identities for sure, those bringing the suit feared for their safety and their ability to ever work again in American carnivals. Networks of families and friends might blackball them. Agents who recruit workers might take a pass on the trouble makers. Workers from Mexico are at the mercy of so many forces. Filed under the name of Doe, the lawsuit alleged substandard living conditions, uncompensated work hours and pay below the minimum wage. The groups helping with the lawsuit also participated in a study called, “Taken for a Ride,” conducted by American University. The study alleged such abuses are widespread throughout the country. I eventually worked in carnivals in California, New Jersey, New Mexico, Chicago, Alaska, Minnesota, Oklahoma, Texas, Georgia and Florida. Nobody worked in more carnivals than I worked. I can’t say abuses are widespread. I can say I’ve witnessed them. I once calculated my hourly wage at roughly $2 to $4 an hour. The lawsuit and the national study were fresh on people’s minds. I stood my ground, filming and panning longer and longer and longer. It seemed like forever. Then I tucked the camera in my side-pouch. A split second later, someone walked in as I walked out. “Cold water El Grande?” he said. We laughed. I walked away into the night. Grateful for the bracing shower of a cold-hearted spy, I smelled of cheap soap and a clean escape. Last month was the end of my year working and living in traveling carnivals around the USA. I lived on carnival wages so I also hitchhiked between jumps. I’ve traveled through 36 states, Canada and Mexico, for more than 20,000 miles. My 15,000 miles of hitchhiking makes me the #1 Hitchhiker in America. I worked carnivals in California, New Jersey, New York, Chicago, Alaska, Minnesota, Oklahoma, Texas, Georgia and Florida. I worked rides, games and one freak show. This video is brought to you by HoldtheMayoMedia. I’ve heard that scholars believe when Shakespeare wrote “All the world’s a stage” and “one man in his time plays many parts,” it may have already have been a well known saying. That is because people already noticed life’s stages and that not a single role defined a whole life. Father Michael Juran’s stage is full of characters and so many are him. You might know him as the Human Battering Ram, the Flying Padre, stunt man in “Man with the Golden Arm,” Burt Reynolds stunt double in Smokey and the Bandit II and Father Mike. I met Father Mike in the main bar at the headquarters of the International Independent Showmen’s Association in Gibsonton, Florida. Bellied up to the bar, having a white wine with pals, he took time out to talk to me about his many roles in life. 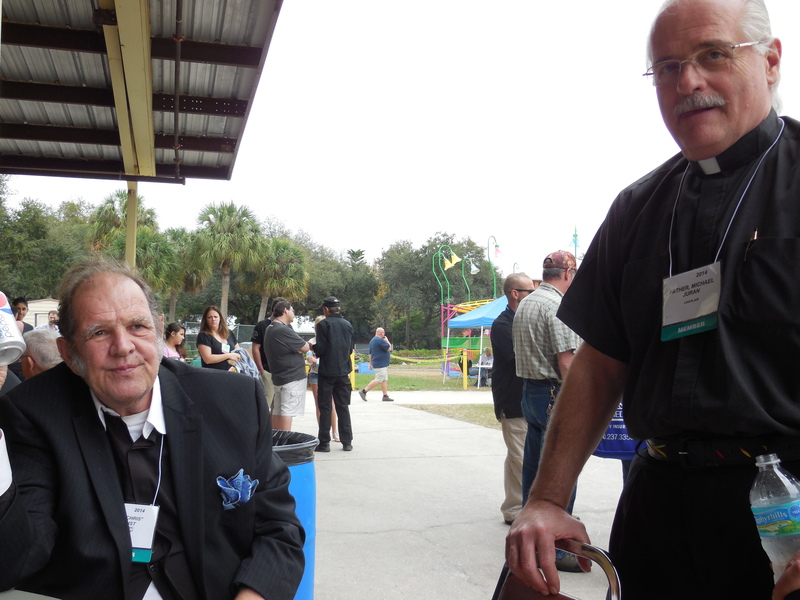 Freak Show owner Chris Christ, left, and Father Michael Juran talk at the IISA Trade Show last month. His life, he says, is part of a “traveling apostolate,” a mission sanctioned by the pope for itinerant workers. When asked why he was both a priest and a stuntman in circuses and carnivals, he hints there may have been some “pompous asses” who didn’t understand. At 65 years old, he’s retired but he’s been a priest for 40 years and a stuntman for 27 years. He performed the “Human Battering Ram,” in which he is strapped to the front of a car as it crashed threw a burning wall. He slept in the trailer for Joie Chitwell Thrill Shows and performed priestly duties in his off hours. He heard confessions, performed baptisms “without the paperwork,” and performed carny weddings. “Jesus didn’t do paperwork,” he’s fond of saying. In a carny wedding, couples get on a carousel. Words are spoken. Blessings made. The carousel turns three times to symbolize the union. When the end of the season comes or the end of the relationship, whichever comes first, the couple gets on the carousel which turns three backward three times signifying the carny divorce. “None of its official,” Father Mike said, and probably all might get him in trouble in some church sectors. Father Mike had their trust, he said, because he walked among them. Confessions happened behind rides, walking along the midway, anyplace, he said. It was barroom banter and couldn’t last long as carnival workers came from every corner to shake his hand and share a story. Father Mike has more stories to tell. A television company is making a documentary about priests that serve the itinerant people at carnivals, circuses, racetracks, rodeos, cruise lines and airports. Christianity is a religion where the Messiah came from the common people and so it stresses that it is with the common people where the divine is to be found. It is also a death defying religion, one where the Messiah defies death and says followers can too. Father Mike drove a fast car down those tracks and defied death, hell bent and heaven sent. Last month I finished a year in carnivals, hitchhiking between shows. I crossed 36 states, Canada and Mexico on my way to racking up 20,000 miles on the road. Many stories were not written as they happened and are now being written as I write a book about the year.